‘The Bling Ring’: Why Is This A Movie? This movie is so fascinating if you want to see obnoxious people do cocaine in a car, or cocaine in a club bathroom, or sit in a closet. There’s the added bonus of seeing repetitive security camera footage. Oh, and you’ll love all the paparazzi videos of no-talent celebrities that you never cared about seeing before. Cutting edge. Seriously, how much money did they give Harris Savides and Christopher Blauvelt to do this? Apply lipgloss… for the entire movie. Vapid, obnoxious characters everywhere. I doubt their real-life counterparts fare any better, but this is a film. If an audience is going to spend money and 2 hours of their time watching these losers, then at least add some dynamics. None of their underdeveloped, pathetic backstories do anything for sympathy. I stand by my opinion that Emma Watson is not a very good actress. Her American accents create painful movie-going experiences and that goes against the fact that the person she portrays in this garbage probably cannot even articulate the alphabet. I’m not going to bother talking specifically about anyone else because they all bore me beyond belief. the nonlinear moments and voiceover cut-ins add nothing interesting. This entire film could’ve been 30 minutes long and still told the same dull story. It could’ve been 10 minutes long and maybe we’d have an interesting short film, or zero minutes because it shouldn’t exist in the first place. The music is the only thing that works for this film… until the characters sing along to nearly every song. Swarms of zombies seen from afar. Anything up close and personal is left more for the imagination. There are quick moments that Ben Seresin does a great job capturing, such as the red flare lights, pharmacy scene, and rainy runway aesthetic. The films takes the audience to many different places under various conditions, and Seresin does a great job keeping up with those changes. Overall, it seems like his best cinematic work. There are no outstanding performances in this film, except maybe from a couple zombies. Brad Pitt plays it straight as Gerry, the family man well-endowed with survival skills. Pitt is a brilliant character actor and roles like these don’t do justice for his talents. I’d rather see Tyler Durden fight zombies, Detective David Mills investigating the cure, or Rusty Ryan steal from a zombie-infested research center. We hear of Gerry’s backstory in dialogue, but why bother if he’s just so normal and blasé? Gerry seems quick-witted and more importantly, unflawed, making his character much less interesting. Expect more of an action movie than a blood-and-guts film. 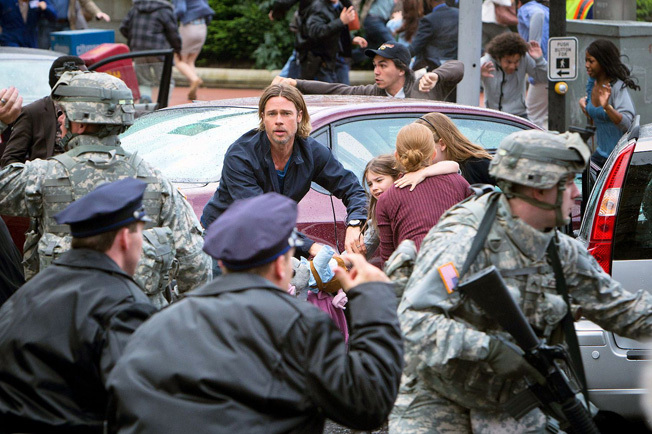 Marc Forster does a great job capturing the global chaos of a zombie apocalypse, but he does not focus much on individuals in danger, leaving audiences with less sympathy toward the film’s many zombie victims. The film constantly moves from place to place with its shaky camera, which is understandable given the circumstances of a global apocalypse, but it needs more beats for Gerry’s character. I attribute this to a lack of character development and while it may not be in the script, Forster could have found some moments within scenes like when the family finds shelter or in Gerry’s many nightmares. Many last-minute, drastic script changes went into this film, resulting in an entirely new ending. Once Pitt’s character leaves his family, the film gradually loses its sense of danger. Zombies are everywhere, but he’s the only character the audience really needs to care for and they already announced the sequel. The film throws so many odd characters into the mix as well without really making much effective use of them. It is an interesting world when zombies run, rather than shuffle around, but anyone familiar with Zombieland won’t see World War Z as pushing any envelopes. In fact, the film loses its edge by its second act, and there’s arguably no tension at all in the convenient and hasty final act. This film does a poor job of setting anything up for the sequel as well, ending as a standalone feature. Marco Beltrami’s score surges through the film but it’s only after that you realize its impact. It’s not about scares, but it is about the tension that builds during a global crisis. The score maintains the suspense of the film more than any other aspect. It’s especially unnerving after Gerry and his family realize that a traffic jam soon becomes a Philadelphia zombie takeover. I’ll start by saying I wasn’t in the best of moods before seeing this but thankfully, this film in not what a lackluster trailer had anyone believing. Many still may not enjoy it but I think that as a comedy, the film did what it should because I felt better while watching it. I even laughed a few times. I don’t believe that comedies shouldn’t have an identifiable style. Usually, it’s the darker comedies, like In Bruges, that take the risk but I think it’s time for the genre to try a little harder. This is why I appreciate The Hangover films because even as mass-appealing comedies, they have a specific look. This is also where praise for a lot of Simon Pegg and British films comes in. The Heat doesn’t really light any cinematic sparks in this department though, which is especially disappointing since you may know the cinematographer, Robert D. Yeoman, for his work on Dogma and many fantastic Wes Anderson films. As a filmgoer, if you’re only looking for some inspiring lighting or memorable long takes, this isn’t the film for you. Melissa McCarthy outshines Sandra Bullock, and everyone else in this film, but both women have great awareness with physical comedy. They swear as much as they like as well, which is a lot with McCarthy’s insults, and it’s unapologetically funny. As per usual, McCarthy’s husband cameos in the film as well. Another great appearance is from Nathan Corddry, for any fan of Studio 60 on the Sunset Strip, and other recognizable television faces include Kaitlin Oslon from It’s Always Sunny in Philadelphia, Tony Hale from Arrested Development, and Andy Buckley from The Office. Paul Feig, above all, is probably the reason this film does hit its comedic beats. His body of work proves his diversity with comedy (yes, not all comedy is the same and not everyone works well with each style), and he sets high standards for female-driven comedies, especially because of Bridesmaids. He seems to be the perfect director for McCarthy as well. She’s one of the funniest women around, but it seems that especially with Feig does her natural humor as the inappropriate character with heart please audiences the most. The payoffs are predictable in Katie Dippold’s script, but at least the film keeps its pace. The problem with many comedies that extend over the 90 minute mark is that so many lose comedic steam midway through. When the energy gets lost in the script, the audience loses the laughter momentum as well. The Heat, playing off of its predictability, comes with a variety of moments so ridiculous that it’s hard not to laugh, like McCartney’s “bad-cop” interrogation style or Bullock’s knife encounter. Not bad for a comedy that extends over 2 hours, especially since a sequel is now in the works. There is an issue with the generic lead characters. I wish they were something new to the buddy-cop genre rather than uptight FBI agent and reckless cop. The fact that they are female leads doesn’t excuse this lack of character development or make it refreshing. Merely dealing with gender doesn’t push any envelopes if the females are written like stereotypical male characters. This is the same issue Zero Dark Thirty had, because why are strong female characters basically written like a male, yet constantly proving themselves to men?